At YouTube, one of our core values is a belief in the freedom of opportunity. We believe anyone should have the opportunity to earn money from the videos they create and turn their channels into successful businesses. That’s why we opened up the YouTube Partner Program nine years ago and why we remain the only platform where anyone with an idea and a camera can turn their videos into full time jobs. 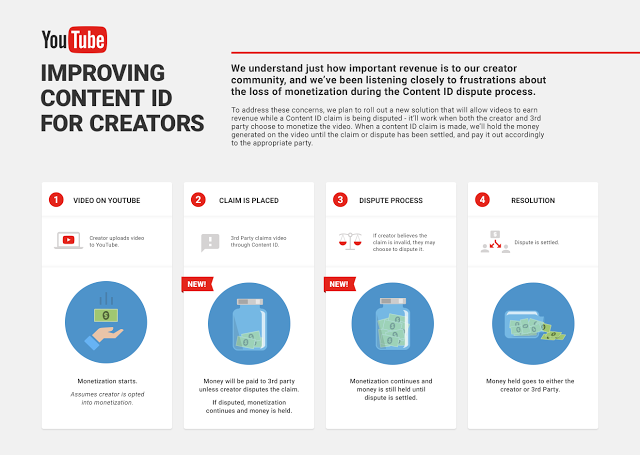 We understand just how important revenue is to our creator community, and we’ve been listening closely to concerns about the loss of monetization during the Content ID dispute process. Currently videos that are claimed and disputed don’t earn revenue for anyone, which is an especially frustrating experience for creators if that claim ends up being incorrect while a video racks up views in its first few days. Today, we’re announcing a major step to help fix that frustrating experience. We’re developing a new solution that will allow videos to earn revenue while a Content ID claim is being disputed. Here’s how it will work: when both a creator and someone making a claim choose to monetize a video, we will continue to run ads on that video and hold the resulting revenue separately. Once the Content ID claim or dispute is resolved, we’ll pay out that revenue to the appropriate party. We strongly believe in fair use and believe that this improvement to Content ID will make a real difference. In addition to our work on the Content ID dispute process, we’re also paying close attention to creators’ concerns about copyright claims on videos they believe may be fair use. We want to help both the YouTube community and copyright owners alike better understand what fair use looks like online, which is why we launched our fair use protection program last year and recently introduced new Help Center pages on this topic. Even though Content ID claims are disputed less than 1% of the time, we agree that this process could be better. Making sure our Content ID tools are being used properly is deeply important to us, so we’ve built a dedicated team to monitor this. Using a combination of algorithms and manual review, this team has resolved millions of invalid claims in the last year alone, and acted on millions more before they impacted creators. The team also restricts feature access and even terminates a partner’s access to Content ID tools if we find they are repeatedly abusing these tools. We will continue to invest in both people and technology to make sure that Content ID keeps working for creators and rightsholders. We want to thank everyone who’s shared their concerns about unintended effects from Content ID claims. It’s allowed us to create a better system for everyone and we hope to share more updates soon. Just say the word Australia, and people immediately think of the elegant sails of the Sydney Opera House, jutting out into the water of Circular Quay. An Australian icon, this architectural wonder transcends its location. And starting today it’s easier for anyone, anywhere in the world to experience the many sights and sounds of this masterpiece, with the opening of the Sydney Opera House on the Google Cultural Institute. 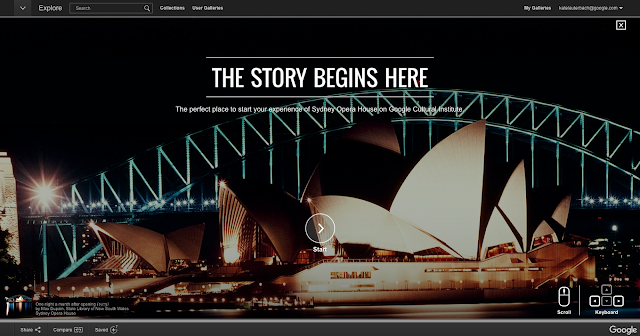 The Google Cultural Institute provides a new digital home for the Sydney Opera House, bringing together more than 1,000 artefacts and 60 years of history in a single online platform. From architect Jørn Utzon’s early designs, to the inner workings of the world’s biggest mechanical organ, to spectacular late night shows, these 50 online exhibits capture the Sydney Opera House from every angle. “The Story Begins Here” exhibit explores the history of the building, the performances and events that have taken place on Bennelong Point. This new collection showcases the variety of culture on offer at one of the world’s busiest performing arts centres, and brings many treasures out of the archives and into the spotlight for people to appreciate. Some of the rare content includes photographs of the opening with Queen Elizabeth II in 1973, roof design sketches from master builder and lead engineer Ove Arup, the diaries of architect Peter Hall, and Utzon's personal collection of photographs from the project, spanning nearly a decade. The sculptural elegance of the Opera House has made it one of the most recognisable buildings of the 20th century. In addition to exhibits which tell the stories of the history and development of this architectural masterpiece, today’s launch includes a brand new 360° experience offering insights into the between-the-acts magic of the House. Starting at dawn beneath the sails, you can continue on to enjoy incidental performances by Soprano Nicole Car and the Sydney Symphony Orchestra, and then journey to many seldom seen areas of the House. With new Street View imagery, you can virtually wander in and around the Opera House at your own pace, taking in stunning views from all angles. Gaze at the white sails overlooking Sydney’s picturesque harbour, feel what it’s like to stand on the Joan Sutherland Theatre stage and look up at the acoustic clouds of the Concert Hall. The new collection opens today at g.co/sydneyoperahouse on the Google Cultural Institute website and is available for anyone on mobile phones, tablets and desktop computers. You can also view it via the new Google Arts & Culture mobile app from your iOS or Android device. We hope you enjoy experiencing the past, present and future of this World Heritage masterpiece. All parents dream about what their children will grow up to do. Will they be a nurse? A farmer? A scientist or a performer? Increasingly, they are asking themselves if their children will one day work in one of the countless career paths that are being transformed by technology. Computer science, or CS, is helping people to innovate in an increasing number of professions, from hospitality to hospitals. You don't have to become a computer scientist, but having skills in computational thinking and coding it and combining it with your passion will open up a world of opportunities. Research shows that 75% of the fastest growing occupations require skills in science, technology, engineering and maths (STEM), which are the building blocks for a career in CS. We believe Australia’s innovation, growth and future prosperity depends on developing critical skills in STEM. A career in CS begins in the classroom. Teachers are the key to both educating and inspiring the next generation of innovators in the classroom and we’re delighted to continue supporting their development through our Computer Science for High Schools (CS4HS) program. CS4HS provides teachers with the skills and resources they need to teach computational thinking and computer science concepts in fun and engaging ways. To date, CS4HS has trained more than 20,000 teachers, reaching an estimated 1 million students in more than 400 locations worldwide. Closer to home, we are supporting 26 organisations across Australia and New Zealand that will provide this important training to K-12 school teachers (the full list is below). This year, we hope to reach around 3,500 high school, primary school and pre-service Aussie and Kiwi teachers. In addition to the workshops, we are also providing free online professional teacher development in partnership with Adelaide University. If you want to know where computer science can take kids, have a look at Careers with Code. In the future, young Australians will use computer science to do great things. And it will all have started with a great teacher. We’re pleased to announce this year’s recipients of the CS4HS grants in Australia and New Zealand. To set a goal (like “exercise more”), simply answer a few questions (like “how often?” and “best time?”). Calendar will then look at your schedule and find the best windows to pencil in time for that goal. Achieving your goals isn’t always easy—especially when your schedule is changing all the time—but Calendar can help in a couple of ways. For example, Calendar will automatically reschedule if you add another event that's a direct conflict with a goal (yep, Friday night drinks just bumped that run!). You can also defer a goal at any time, and Calendar will make time for it later (no more excuses huh!). Finally, Calendar actually gets better at scheduling the more you use it. Just defer, edit or complete your goals like normal and Calendar will choose times that suit you even better in the future. A calendar should help you make the most of your time, not just track events. So as Google Calendar turns 10 today (🎉), we're excited for more updates like Goals, and to help you find time for everything that matters. To get started, download the Google Calendar app for Android or iPhone, and set your first goal. Whether it’s reading more books, learning a new language or hitting the gym more regularly, achieving your goals can be hard. One day it's a last-minute meeting... the next day it's a friend’s birthday dinner. And before you know it, your goals are out the window. That’s why starting today, we’re introducing Goals in Google Calendar. Just add a personal goal—like “run 3 times a week” and Calendar will help you find the time to do it. to treadmill dancing in Ok Go’s Here It Goes Again, music artists have always been on the hunt for creative ways to tell their story. The art of the music video was born on MTV (and the diehards among us still love watching the classics on Rage at late night house parties). Later on, with the arrival of YouTube and mobile, everyone could watch their favourite music videos wherever and whenever they wanted. Today, mobile technology is helping artists stretch the limits of what’s possible even further by inviting their audience to interact with and manipulate their work. 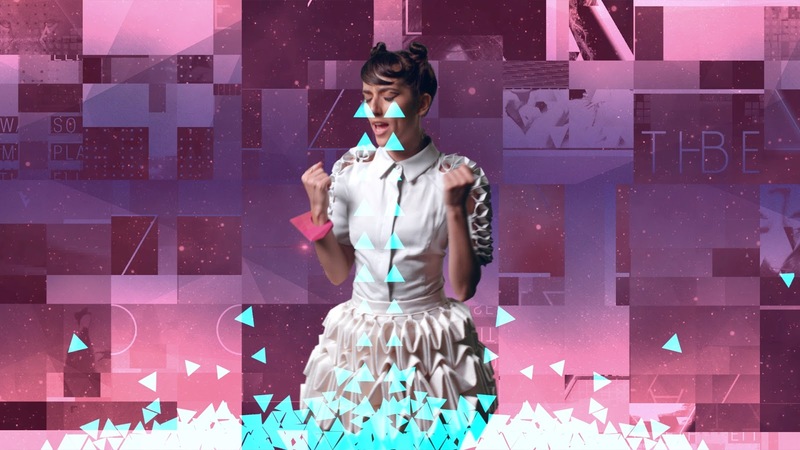 The idea for a mobile interactive music video was born. The song is about the crazy range of emotions you feel in a relationship. By tapping, swiping and tilting your phone during the video, you can mess with her emotions, make her cry and even slice her in half. Check out her new album ‘Intra’, which you can listen to for free with a Google Play Music trial. From face-morphing technology in Michael Jackson’s Black Or White to treadmill dancing in Ok Go’s Here It Goes Again, music artists have always been on the hunt for creative ways to tell their story. and the Australian Chamber of Commerce and Industry in Adelaide yesterday. More than 100 small business owners and operators came along to hear from digital experts, including Google Australia’s Head of Engineering Alan Noble, about how they can optimise their business’s online presence and marketing for the digital world. Minister for Industry, Science and Innovation, Hon Christopher Pyne MP opened the event and spoke about the potential for technology to boost businesses in South Australia. He also shared his own experience of using Google to find and then navigate to a camera shop when recently traveling overseas with his family! Adelaide already has its fair share of online champions. Steve Cox from Magic Steam Dry Cleaning spoke at the event about how he used AdWords to expand the reach of his business and target new customers in the commercial sector. Aaron Buchan from Cross Training Systems shared his experience with Google Street View for Business, which has helped to bring in new clients by allowing them to virtually step inside his gym with just a few swipes on their phone. Guests were able to view some of the inside business imagery on the Liquid Galaxy display. The potential for Australian businesses is huge. Research from Deloitte reveals SMBs that are online are twice as likely to be growing and four times as likely to be hiring staff. Another report commissioned by Google last year found that Australian small businesses could unlock almost $50 billion in additional output over the next ten years by making better use of the internet and mobile technologies. With people increasingly using their mobiles to search for information and make purchases, mobile site design is as important as ever. Businesses had the chance to test how mobile friendly their websites are and get tips on how to improve mobile presence. Thinking about what this means for your business? You can find out more about getting online and get started today at Google My Business. What do a dry-cleaner, personal trainer and hot air balloon operator have in common? No, it’s not the beginning of a bad joke. These are just some examples of the Australian businesses using digital to help their business grow. These businesses were featured at a training event hosted by Google, Business SA and the Australian Chamber of Commerce and Industry in Adelaide yesterday. More than 100 small business owners and operators came along to hear from digital experts, including Google Australia’s Head of Engineering Alan Noble, about how they can optimise their business’s online presence and marketing for the digital world. Do your socks mysteriously disappear after you've done a load of washing? This is a serious problem for many Australians, who end up with boxes and boxes of mismatched socks. Every year we have been resigned to add new orphans to the box… until today. These new bluetooth-enabled socks are fitted with thin LTE beacons that wrap around the top of your lower calf, just like the coloured stripes you’d see on traditional socks. 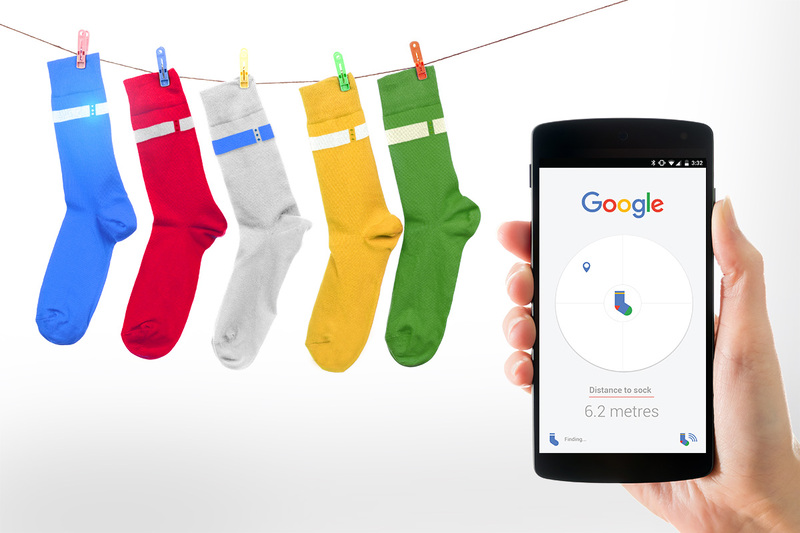 If you can’t find one sock, you can press the beacon on its pair and let the Google Search app on your phone pinpoint its whereabouts. The missing sock will then sing this song to help you find it. We’ve been working hard to make this technology small and seamless (literally). You won’t even notice the technology is there. For the fashion-conscious, the socks are available in blue, red, yellow, and green. You can also purchase a pure white version from the Google Store that allows the beacon strip to camouflage with the rest of the sock. We’ll be open-sourcing the technology later this year, with the idea of creating an entire ecosystem of developers and sock makers. Old socks can also be retrofitted with this same technology, so that they never go missing again either. Simply attach a Searchable beacon strip to each sock and you’re ready to walk.